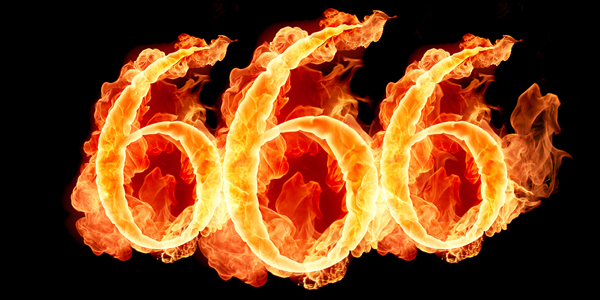 In mathematics, 666 (six hundred sixty six) is the natural number following 665 and preceeding 667. In religion, folklore and popular culture, 666 is called the “number of the beast” in Chapter 13 of the Book of Revelation of the New Testament. In the Textus Receptus manuscripts of the New Testament, the Book of Revelation (13:17-18) cryptically asserts 666 to be “man’s number” or “the number of man” associated with the beast, an antagonistic creature that appears briefly about two-thirds into the apocalyptic vision. In modern popular culture, 666 has become one of the most widely recognized symbols for the Antichrist or, alternatively, the devil. The number 666 is purportedly used to invoke Satan. References to the number occur both among apocalypticist Christian groups and in explicitly anti-Christian subcultures. References in contemporary Western art or literature are, more likely than not, international references to the Beast symbolism. It is common to see the symbolic role of the integer 666 transferred to the digit sequence 6-6-6. Some people take the Satanic associations of 666 so seriously that they avoid things related to 666 or the digits 6-6-6. 666 may stand, represent, mean and signify a wide variety of facts or fiction; but to me (in this particular blog/article) stands for nothing more but antonantonio@blogspot.com Article No. 666.